One Kickstarter campaign is aiming to turn smartphone photos into snapshots that look like they’re straight off a trippy science-fiction flick or Jimi Hendrix album cover. How? Digital infrared filters. Infrared photography is a medium adapted by many for the weirdly beautiful colors it produces, but it’s a rather expensive hobby to get into, given the cost of converting a sensor or adding a filter to a DSLR. This new project, #Infra, aims to change that with a simple app. 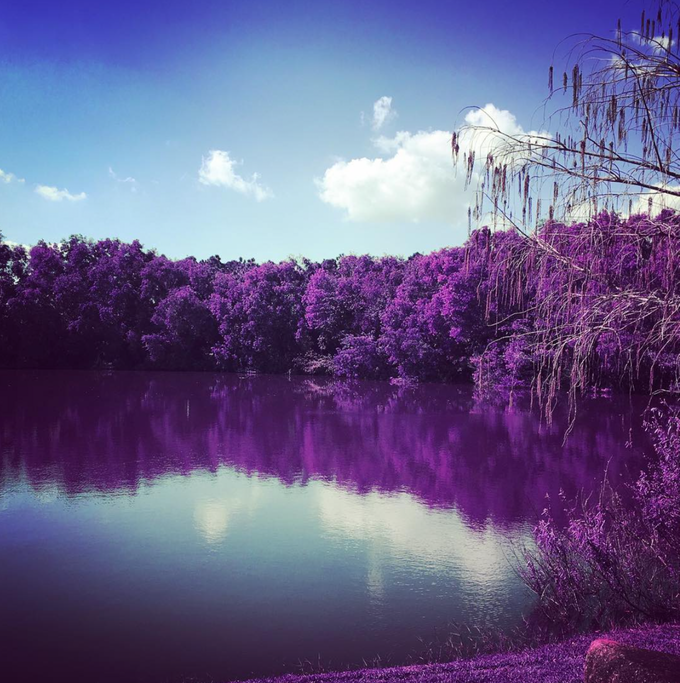 The iOS app is expected to come with a set of at least six infrared filters to mimic the effect. The Kickstarter project is looking for $5,000 in funding to finalize the development of the software — and it hit 25 percent of its goal in the first 24 hours. According to the developers, the filters mimic the look of Kodak Aerochrome film as well as other types of processed infrared images. Current samples from #Infra favor purple trees and deep blue skies. While digital filters likely won’t create the results that the military used to see past camouflage, the app aims to make infrared widely accessible. A digital camera with an infrared filter usually turns green foliage white, creating a scene that almost looks like a barren winter world. Many infrared photographers often use post processing techniques to convert the image into a landscape that looks more like it exists on a Candy Land board game than your average earthly scene. Cost isn’t the only element making infrared photography difficult today either. Even using a filter on a DSLR, cutting out the visible light spectrum leaves little light left to expose the image, so IR images shot this way are always long exposures. That makes it impossible to use IR on moving subjects. Editing a digital IR image to get that colorful look is also a technique that’s not well-suited to beginners. Developers say the app will be similar to the iPhone’s native camera — except for the IR filters of course. If the group exceeds their initial goal and hits a $10,000 stretch goal, they will also work on an Android app. The Kickstarter campaign, which has pledges starting at $5, aims to reach $5,000 by August 15.